These invitations and envelopes are perfect for any Mickey Mouse fan's party! With 6 of each in a pack, they're easily coordinated with the rest of our Mickey Mouse party supplies for your complete party planning needs! 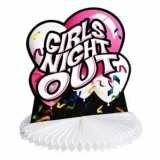 The Girls Night Out centrepiece is the perfect hens party decoration and you can keep afterwards as a memento of the awesome event!